Fruit bats? 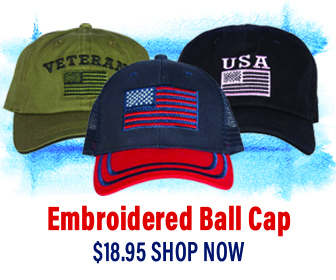 Here in the U.S.? Well, no, except for a few along the border with Mexico. Most of the 40 bat species that live in the U.S. and Canada eat insects—and we’re darn lucky they do that for us, both for the crops they protect (about $3.7 billion-worth per year!) and for the reduction of biting insects (kind of hard to count the bites we didn’t get, but yay, right?). Let’s talk about these fruit bats, though, because they’re superheroes to us in other ways, even though they’re not hanging out in our backyards and local parks. Where do fruit bats live? In the tropics, and that’s where they perform their magic for rainforests and many of the things we like to eat. While bats living in temperate regions must migrate or hibernate when temperatures drop, fruit bats living in the tropics can hang out year round. They keep themselves busy by rescuing rainforests ravaged by clear-cutting, grazing, and other human-caused damages to the land. Let’s get to some basic bat facts. All bats belong to a group of mammals called Chiroptera, which means “hand-wing,” a reference to the hand-like structure of the bones in their wings. There are well over 1,000 bat species worldwide (some say over 1,300), and they account for about a quarter of all mammal species. Only rodents make up a larger portion of mammalian species. Only three of these many bat species feed on blood—so that Dracula image is actually pretty irrelevant to the group as a whole—and those three live in South America and don’t care for humans. When we say fruit bats live in the tropics, they’re not exactly lounging around like some of us might do there. In fact, their unofficial but highly accurate nick-name is “the farmers of the tropics.” They spend their time pollinating fruits and scattering seeds far and wide. Some plants even adapt themselves to favor bat pollination methods, attracting them with special scents and flower forms that specially suit bats. When it comes to scattering seeds, bats will boldly go where no bird will go, crossing wide open areas that desperately need replanting, while birds choose to stay close to cover. 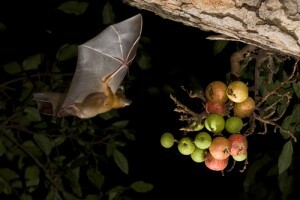 For this reason, fruit bats are credited with contributing to about 95% of first new growth to open areas. This new growth is crucial, because without it the plants that only grow with a little protective cover would be unable to even get started. That’s why fruit bats are rainforest superheroes. When things are at their bleakest, bats swoop in and deliver the seeds of hope and regeneration! And what about fruit bats being superheroes to omnivores? Well, take a look at some of the over 300 plant species in the Old World tropics alone that depend upon bats for seed dispersal or pollination. Do you like bananas, peaches, or mangoes? Thank a fruit bat! How about carob, figs, dates, cloves, cashews, and avocadoes? Seriously, if you could, you should hug a fruit bat! Wait, no—they almost certainly wouldn’t like that. 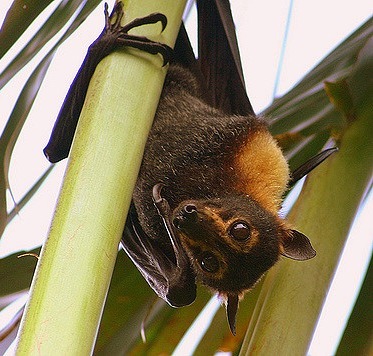 Unfortunately, some humans are harming fruit bats instead of helping them. Huge numbers of fruit bats are being overhunted for the commercial “bushmeat” trade. This is particularly harmful given that many are “keystone” species that are essential to their ecosystems. And, once depleted, bat populations have trouble rebounding, because females only have one pup per year. In the tropics bats live in a wider range of roosts than in temperate regions. Naturally, their range in size plays a role, because a giant fruit bat may have up to a six-foot wingspan, while other species can be quite tiny. Some roost in animal burrows, some in flowers, some in termite nests (oy! ), and some in large spider webs (yeah… apparently spiders are, indeed, much bigger in the tropics!). Smaller fruit bats roost in large leaves that they fashion into tiny tents, using their teeth. Diverse and talented though they may be, bats must have habitat, and habitat loss is the most significant threat that is causing bat populations to decline worldwide. At least 26 species are listed by the Bat Conservation International ) as “Critically Endangered,” and hundreds more are on the next couple levels of serious conservation concern. Unfortunately, bats are among the most under-studied mammals, so many more species may be imperiled, too, and we simply don’t realize it yet. Since habitat loss is the main problem, one thing you can do to help bats in the tropics is to carefully consider your purchases and avoid any products that come at the expense of tropical forests. Threats to bats here in the U.S. Bat species here in the U.S. are suffering significant losses, too. Habitat loss is a problem for bats here, just as it is for many other North American wildlife species. Bats are also being killed by White-nose Syndrome (WNS), a disease caused by a fungus that attacks hibernating bats, usually because their hibernation roosts have been disturbed by humans. WNS kills up to 100% of bats at some roosts and has killed over 5.7 million bats so far. Scientists estimate that unless something dramatic happens to stop, or at least slow, the disease, the little brown bat (the bat you’re most likely to be familiar with) will be reduced to only 1% of its pre-WNS numbers as early as 2030. Bats are also killed in great numbers by wind turbines. Some collide with the blades and others succumb to ruptured blood vessels caused by the sudden changes in pressure near the turbines. Keep habitat natural whenever and wherever you can. Leave old hollow trees standing if you can do so safely. Eliminate or reduce use of pesticides. Don’t disturb known bat roosting sites. 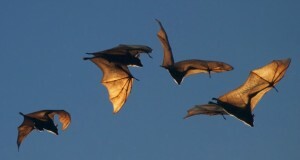 Opt for humane resolutions if you discover a bat in your house or discover bats are roosting in your attic or elsewhere. 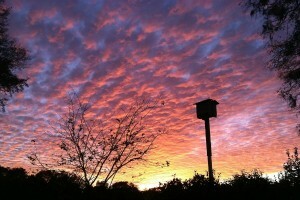 Consider putting up bat roosting boxes. Check out Bat Conservation International for specific recommendations on how to do this successfully, and for more suggestions on how to help bats. Hey Buddy!, I found this information for you: "Fruit Bats: Superheroes of Rainforests and Omnivores Everywhere". Here is the website link: https://effectivewildlifesolutions.com/fruit-bats-superheroes-rainforests-omnivores/. Thank you.